This radio frequency bug detector truly separates itself from the rest of them and I think you will agree. 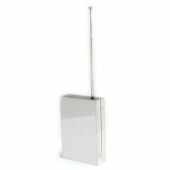 RF detectors are simply a radio frequency receiving device. 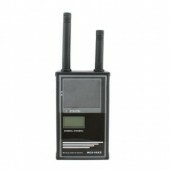 It is designed to detect wireless signals that are being transmitted within a certain frequency range. 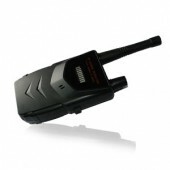 For example a wireless hidden camera is designed to transmit video to a video receiver. Some wireless transmitters are designed to transmitt as far as 3 miles away while others can only be received one room away. So the stronger the signal being transmitted the easier it is for the bug detector to detect it. Some micro spy cams are designed to output a very low signal making them very hard to detect. You may need to be very close to the camera or bug to detect it. They are designed this way not to be easily detected. The problem is if the detector is too sensitive it gives a false alarm. 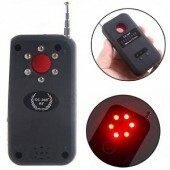 If it is not sensitive enough it does not detect the signal well enough. This is what separates this bug detector from some of the others you see. 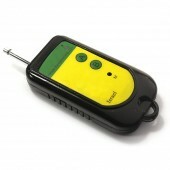 It has a built in sensitivity adjustment allowing you to detect those not so easy to detect wireless bug transmitters. Yes some spy cameras are very difficult to detect. You can sweep the suspect area then gradually increase the sensitivity until you eventually hone in on the target. 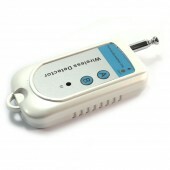 It has a silent vibrate mode as well so you can use it without it sounding an audible alarm. It also has an earphone jack so if you choose you can use the included earphones while making your sweep. The after sales service of your clerk is very thoughtful. Thanks. The product is of good quality and it is not that expensive, I think it is excellent. Easy to operate and convinent to bring with.I like it very much. Easy to order from and doesn't waste your time, with requests to add account. Great experience.